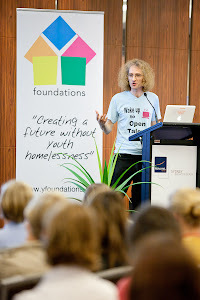 A couple of weeks ago, I took part in a V event to raise awareness about youth homelessness. It was an open mic style evening at Westminster University, to which myself and two other charities had been invited to provide some speeches in between the open mic musical performances. My contribution was based around a bucket, representing the big change in thinking and behaviour we all need to lead on, instead of the small change of coins by which we dispose of the issues and our responsibility in solving them. The bucket was my performance prop, and I hoped at the end of the evening to give the audience that image to carry with them for some time to come. What talent do you have to put in the bucket, to bring about real change? Every time they saw a coin bucket, I wanted them to think of the bigger bucket inside their minds and hearts. At the start of the evening, something fascinating happened. The event was actually being used to promote the work of Crisis, whose leaflets and small change bucket were plastered across the room. There are lots of charities working in this field, and in the run up to Christmas, Crisis is one that many people rightly think of. Like a dog, though, a charity is not just for Christmas – but nevertheless, that’s how our social thinking works. When the representative from Crisis arrived, and we were introduced, I was looking forward to an interesting conversation about how our respective work contributed to the issues the event was exploring. Instead, the representative just smiled politely. ‘ Foyer who?’. I tried to explain. ‘Should I know you?’ the person said, half apologetically. Behind us, the big projection screen would show that there were around 80,000 young people experiencing the stereotype homeless. My organisation worked with 10,000 – should they know us? This was and is the real crisis. Not the charity name, but a crisis in charity itself. We spend most of our time promoting the problems and asking for money to solve them, but take minimal responsibility for the way we act ourselves. We don’t really know each other. We don’t really love each other. Rather than finding new ways to collaborate, we mostly compete against one another in endless funding and marketing duals. We think more of our own survival and wouldn’t think twice about taking the cake for ourselves without any sense of responsibility for fair distribution between us. We often spend our time gossiping about each other’s weaknesses. We don’t really share our resources to create the biggest impact. We hardly ever go looking at how we can support each other. We care for the cause in equal measure but don’t have time to care about each other. And yet here we all are, at the same event, oblivious to the real crisis: that the values by which we work directly equate to and reflect the problems we are working with. We are homeless charities, who have no home for each other. ‘Should I know you?’ she said. We are in a Crisis, we are seeking Shelter, we want some Prince’s Trust, we care to take Action for Children, we believe in Kids Company, we are making a Centrepoint, we are Foyer Federation...and so many more. In the Home for Advantaged Thinking, no one is at home unless everyone is. Making a home for people must begin with how we work with ourselves. It starts here, inside us. How can I know you?